A sake drinker Ichibay reports events that occur in his daily life and coveys his casually conceived ideas, focusing especially on sake and sake-related items and events. He sometimes writes about his short trips in his country Japan or provides some Japanese cultural stuff related to kimono, local performing arts, etc. Last week, I thought it would be nice to go to Okutama Lake and see autumn leaves. So, my friend and I went to the lake. If you go westward along the road on the north lakeside, across the Minedani-bashi Bridge, and through the tunnel, you will find a float bridge on Okutama Lake. The float bridge connects the north and south sides of the lake. We got off the bus at a bus stop on the lake and got to the north end of the float bridge. It was already past noon. Formerly, they used oil drums as floats of this bridge, which was, therefore, called "Drum Bridge." Now, they are using float made of some plastic material. Because they discontinued using drums or for another reason, this bridge is not called "Drum Bridge" any longer. Instead, it is called just "Mugiyama Float Bridge" (Mugiyama seems to be a name of a place). To me, "Drum Bridge" sounds nicer, but actually no drums are used for the bridge. So, maybe there is no longer a reason to include "drum" in the name of this bridge. We walked on this interesting shaky bridge to the opposite side. Then, we walked for about an hour along the trail on the south shore, to reach "Yama no Furusato Mura," which is facilities, where visitors can have lunch at the restaurant, learn about nature of the Okutama area, enjoy camping, and do other activities. As to autumn leaves, it was still early for seeing the most beautiful colors. Maybe, this weekend will be fine? Anyway, while hearing chirping wild birds, and walking on rustling fallen leaves is quite relaxing and refreshing. 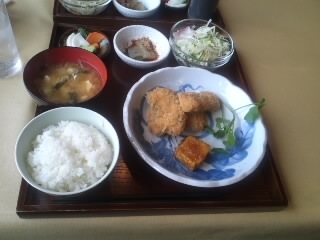 At the restaurant of "Yama no Furusato Mura," we had a late lunch. The fried Okutama Yamame Trout was nice. After the lunch, I used my portable gas stove to boil some water outside the restaurant. I placed a small bottle of sake in the warmed water to make warmed sake. The table and benches were in the warm afternoon sunshine, and staying there was cozy. However, when it was close to three o'clock, the sun moved to behind the western mountains. Then, suddenly, it became cold. We realized we were in mountains, and it was good that I had prepared my equipment for warmed sake. Finally got a kandouko (sake warmer)! I want a sake warmer! After having a look at the Saru-hashi Bridge, I want to drink Gokyo. Shoot a target and get canned food!